About five years ago geophysicists and gravitational wave astrophysicists began working together, notably through the UnivEarthS Labex. The point of contact was very simple and at the same time very vague: earthquakes and seismic fluctuations represent a noise for gravitational wave detectors and a signal for geophysicists. 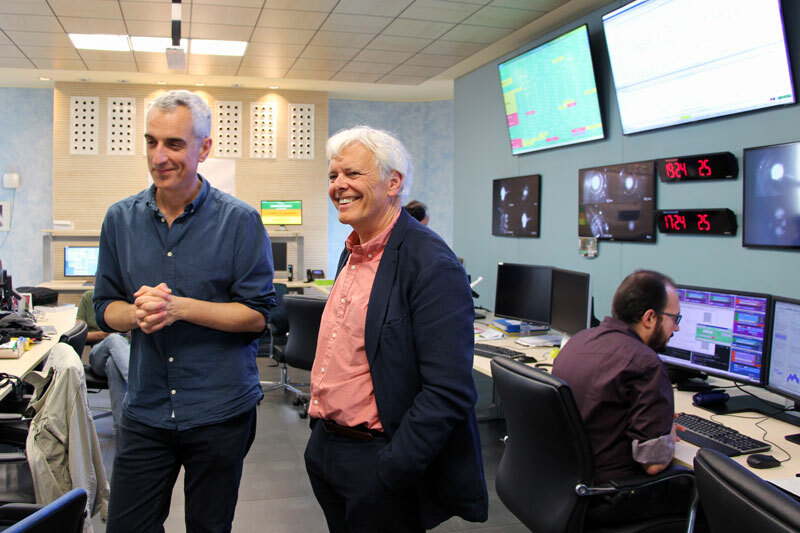 Matteo Barsuglia, astrophysicist, and Jean-Paul Montagner, geophysicist, in the control room of the VIRGO instrument. They are at the origin of the UnivEarthS Geophysics and gravitational wave detectors project. From this strange connection was born a visionary idea: to use the almost instantaneous changes in gravity produced during an earthquake to improve early warning systems for earthquakes. This is both to save precious time and set up security procedures, but also to determine earlier the precise magnitude of the earthquake, always with the aim of alerting populations, for example for tsunamis. The results of this research made headlines in 2015 with an article published on “Nature Communications” and December 2017 with a publication “Science”. In these two articles we highlighted for the first time a gravitational signal during the great Tohoku earthquake in 2011, the one that was indirectly responsible for the Fukushima disaster. In the article on Science we also showed, for the first time, how with a rapid detection of gravity, we could have determined the magnitude of the Tohoku earthquake in 3 minutes instead of a few tens of minutes! To go further, and to have faster warnings and for smaller earthquakes, new detectors are needed, and the technologies developed for gravitational waves could play a role. The EGO-Virgo site in Italia, where is located the European gravitationnal wawes detector. The motivation behind this film is twofold. First, explain to a wide audience these latest developments in seismology and how they could help reduce the damage caused by large earthquakes. And two, tell the story of a close and fruitful collaboration between geophysicists and gravitational wave physicists. This project is truly a major illustration of the power of interdisciplinarity and the ability to generate new ideas by combining different points of view on the same subject, an idea that is at the heart of the collaborations promoted by UnivEarthS. 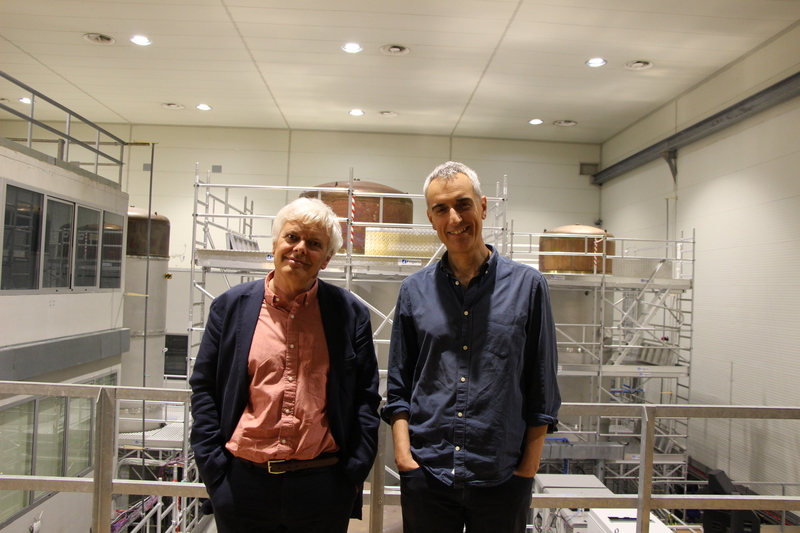 Matteo Barsuglia et Jean-Paul Montagner dans la salle de contrôle de l’instrument VIRGO. 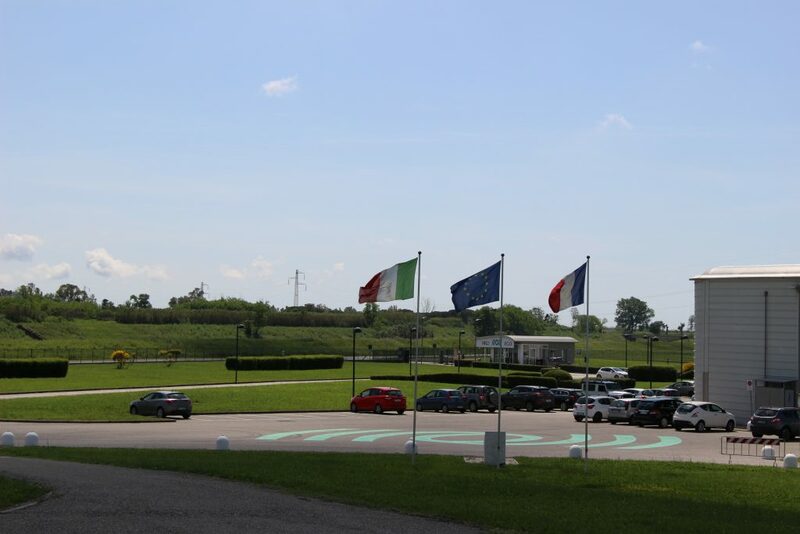 The film crew, composed of Jean-Luc Robert, Clémence Epitalon and Jean-Michel Gerber, first went to Italy at the end of May, on the EGO-Virgo site where the great European gravitational wave detector is located an ideal place to talk about gravity signals ! The week was intense and allowed to interview various researchers, who shared with us the functioning of the gravitational waves, of the detector, and their progress in relation to earthquakes. The team was also able to take some nice aerial shots of the EGO-Virgo site and the detector. The film crew led by Jean-Luc Robert slid into a corner of the operational control room to interview Julia Casanueva, post-doc working on Virgo. Technical settings before filming Jean-Paul Montagner at the end of the west arm of the VIRGO instrument.. 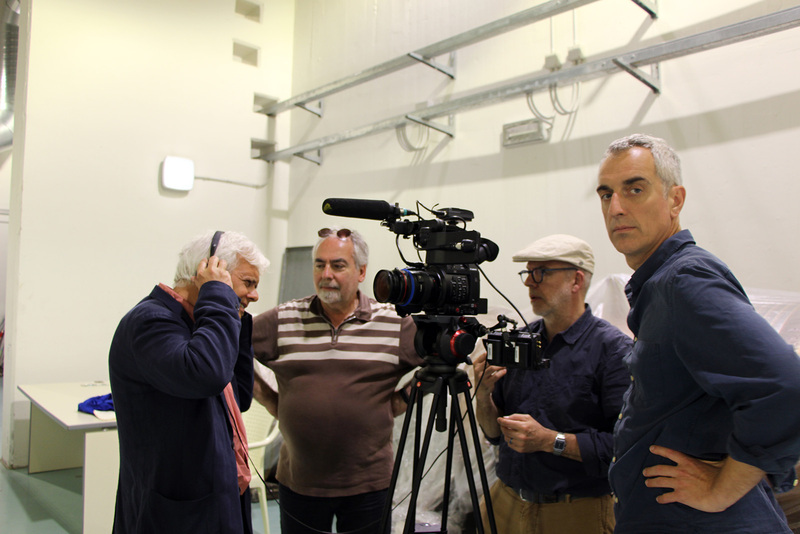 The shooting continued in Paris in June, at the Institut du Globe de Paris, which agreed to receive us to film interviews with Parisian researchers. 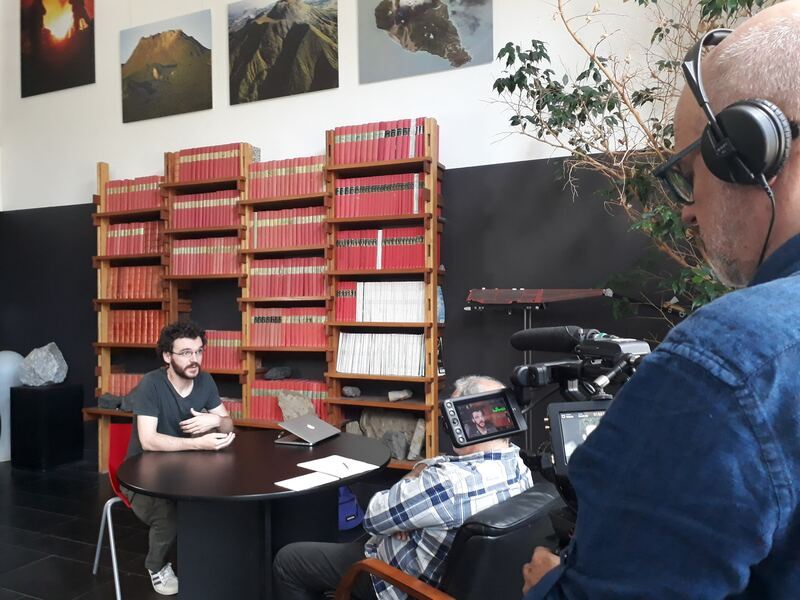 It was the turn of the geophysicists to be interviewed and to share their work on the relationship between earthquakes, the tools currently used and new discoveries in relation to gravity signals. Matteo Barsuglia and Jean-Paul Montagner, the researchers at the origin of the project, will obviously be at the head of the bill, and they will be accompanied by their collaborators who will explain in detail what they are working on, how they arrived at these results, and what they hope to discover. Labex UnivEarthS is very pleased to provide financial and logistical support to this project, whose theme is at the heart of its interdisciplinary mission. In a 17th century Japanese legend, the Japanese archipelago represents the earth’s crust and is symbolized by a “foundation stone”, or “kaname-ishi”. The “namazu” lies on the back of a catfish, the “namazu”, which lives in the mud, in the depths of the earth. The “namazu” is sometimes in the grip of violent movements and causes numerous destructions on the surface of the earth. The God Kashima or “kashima daimyojin” is the only one who can control him and he constantly holds him under his guard, keeping him on the ground with his sword, and immobilizing his head under the stone “kaname-ishi”. But the God Kashima sometimes releases his attention and the “namazu” takes the opportunity to escape and cause further destruction. 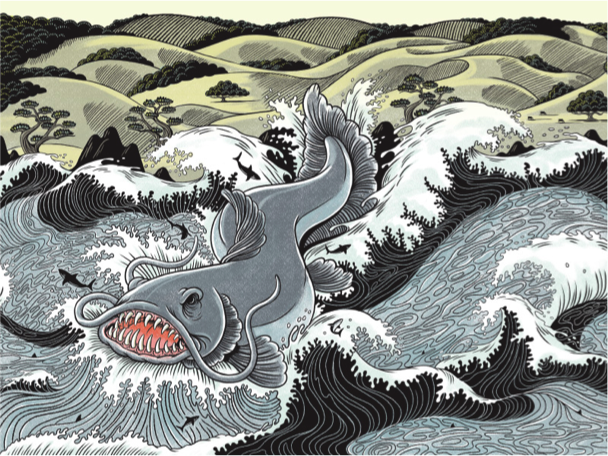 The appearance of the catfish, of discreet nature, has been considered for many centuries as the omen of dark omens (diseases, wars, fires), but it is only from the 17th century that it is assimilated to earthquakes.